As the result of a municipal council decision on October 9th, Prince Edward County will regulate short term rentals like Airbnb’s. The regulations will grandfather existing rentals, but freeze the number of rentals in popular areas like Wellington and Picton. The number of STA’s in the County listed online has tripled in the last three years. This has resulted in several citizen concerns including undermining the County’s sense of community in neighborhoods where STA’s rival or outnumber local residents. In addition, there have also been concerns about several nuisance issues including noise, garbage and parking. As a result, the Council adopted a report in September 2018 directing staff to come up with recommended regulations. The October 9th decision was preceded by extensive public consultation which resulted in the Official Plan amendment and the Zoning By-Law amendment which Council approved. Even though few owners and investors were aware of it, STA’s where the owner is not resident on site were not legal under the County’s existing zoning by-law until the amendments were passed on October 9th. In the absence of the new regulations, a resident who is concerned about an STA could complain to the County’s by-law enforcement officer and ask to have the business shut down illegal. If the County chose to ignore the complaint, the resident could take the County to court to have the municipality enforce the by-law. Instead of a nasty battle with neighbors attempting to shut down non-resident STA’s through by-law enforcement, the regulatory changes will actually protect the interests of non-resident STA owners because they will be legalized and recognized as a permitted use under the County’s amended zoning by-law. Traditional bed & breakfasts, where the owner lives on site. Partial or whole dwelling units (including second units) where the owner’s principal residence is on the same property. Partial or whole dwelling units where the owner’s principal residence is elsewhere. There will be density limits on STA’s which will not be allowed to exceed 15% of the dwellings within a specified radius (smaller in town and larger in rural areas). All STA’s which were in operation as of October 9th will be “grandfathered” and will be eligible for a license, even if the number of STA’s in their area already exceeds the 15% limit. B&B’s and STA’s where the owner’s principal residence is on the same property will not be subject to the density limit. 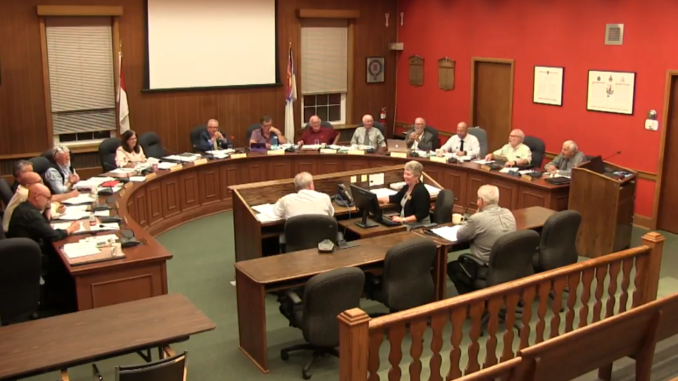 The October 9th Council meeting only dealt with the “enabling legislation” in the form of an Official Plan amendment and a Zoning By-Law change. Based on a staff recommendation, Council decided to postpone a decision on the licensing process until next March at the latest. Licensing was one of the areas of greatest concern among those concerned regulation, and the deferral will allow more time for current STA owners, realtors and others to lobby for what they see as an appropriate licensing process. The upcoming debate around the licensing process will undoubtedly address at least two areas. One will the license requirements. The amendments which were passed last week did clear specify a few things: short-term rentals over four rooms will have to get site specific zoning and all short-term rentals will have to have enough onsite parking to accommodate guests (one spot per bedroom). Beyond that, a minimalist licensing approach might only require proof of ownership, and perhaps a fire code inspection. A more exhaustive licensing approach could add a series of things like tests for water quality, proof of insurance, landscaping to ensure adequate screening from neighbors, etc. The license cost will also be a key focus. When the County researched seven other municipalities which have or are considering regulating short-term accommodation, the fee ranged from a low end of $150 in one town to a maximum of $2,000 in another Ontario community. Council directed staff to come up with recommendations for licensing not later than the end of March 2019 and once approved, it will still take some time for licensing to get underway. Anyone looking to buy a property in the County to run as an STA needs to take two things into account: eligibility for a license, and the costs of obtaining a license. Anyone looking to operate an STA which WILL NOT be their principal residence in a popular area that is already over the density limit will have to either purchase a grandfathered STA there which is automatically eligible for a license, or wait until such time as the density drops below 15% when they will be eligible for a license. Buyers looking to operate a non-resident STA in a rural area zoned rural residential also need to make sure that the property is eligible for a license before a deal is firm. Although homes are more spread out in rural areas, the radius for the calculation of density is also larger there. Buyers planning to operate a “traditional” B&B where the owner is resident will automatically be eligible for a license in most residential zones. However, along with other types of STA’s, traditional B&B’s will not be permitted on any new rural properties severed after October 9th, 2018. A license will ultimately be required for any short-term rental of a dwelling unit, regardless whether the owner lives on site or not. In their financial analysis, buyers will have to consider the license fees which will charged by the municipality, as well any one-time costs to comply with licensing requirements (for example, adding extra parking). Buyers (through their agents) will have to spend the time to research the number of short-term rentals in an area to make sure the property is likely to be eligible for a license. Buyers should who want to run an STA should make offers conditional on obtaining a license or, at minimum, conditional upon getting confirmation from the planning department that the property will be eligible for a license. Sellers are likely to require that offers include an acknowledgement stating that the buyer is aware that short-term rental regulation is possible, that the seller does not guarantee eligibility for a license and that the buyer is responsible to do their own due diligence. It’s also possible that there could be changes in the County real estate market as a result of the regulations. One impact of the new regulations is protect existing rental owners while making it difficult to establish new rentals in the most popular areas such as parts of Picton and Wellington where many are currently concentrated. Although it is too early to say for sure, the regulations could lead to increased prices for existing rentals in such high density areas because of the restriction on new competitors. There could also be a downward pressure on prices for other houses in the high density areas because they won’t be able to get an STA license if the owner lives elsewhere, thus reducing demand. Finally, as noted earlier, buyers should ensure that they have a “Plan B” and that the investment would still make sense in the event the property had to be used as a long-term rental. NOTE: This article provides a high-level summary of the new framework for regulating Short Term Accommodation but it does not contain enough detail to serve as guidance for a real estate investment decision. The new regulations and their implications should be discussed in detail with the realtor representing you as a buyer before going ahead with an offer for a property intended for use as a short-term rental. To discuss the new regulations and the potential implications with Treat Hull, Broker of Record, contact him at 613-503-0027 or treat@treathull.ca.